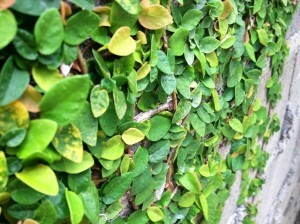 The vine shown in this photo grows well in the tropics on just about any material, such as the raw concrete block wall shown here. Plants are excellent for absorbing the infrared light that we feel as heat. Of course you must have noticed how much cooler it is in the shade of a tree. Plants don’t just block light, but also they continually perspire, and this evaporation is an “endothermic” which means that it cools the water vapor down. Covering a few walls of your house, or perhaps some normally ugly retaining walls, will beautify your architecture and give your home a sophisticated Ivy League look. 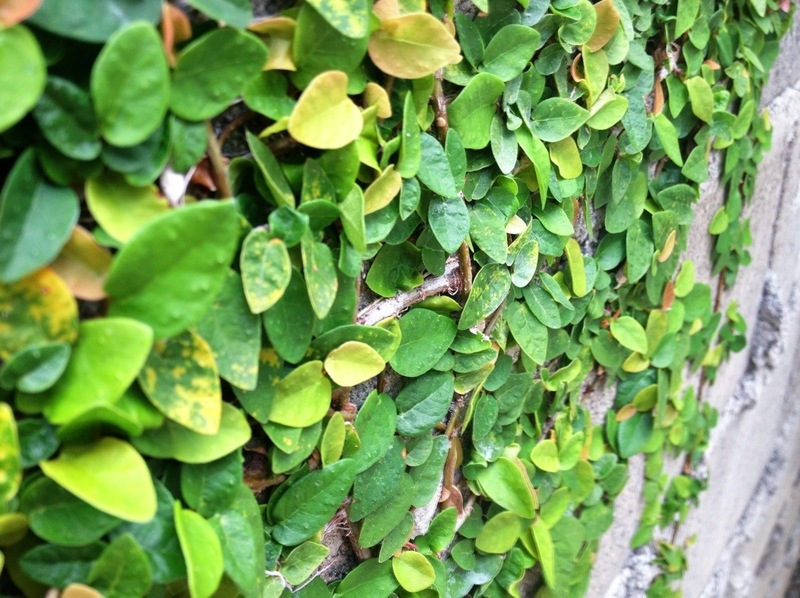 Covering a wall with this small ivy will also save money because you then don’t have to paint or add a stucco, and plus it will last longer than either of those options. This plant grows fairly slowly, but will eventually cover nearly anything, including wood post and beams, and will try to grow in your windows too. It will send roots into any paint or stucco, ruining it so once it’s there you need to be committed to keeping it trimmed.